"Delightfully flavorful barbecued shrimp. Use your favorite barbecue sauce to baste shrimp with." Insert a strip of provolone cheese and 1 teaspoon of the diced green chilies into each shrimp. 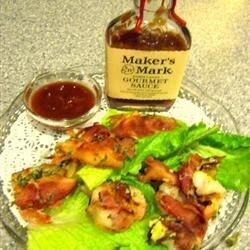 Fold over the shrimp and wrap with a half strip of bacon. Secure with wooden picks. Cook shrimp on grill, basting with your favorite barbecue sauce, until bacon is cooked and shrimp is pink. These little shrimps deliver big, spicy flavor! I have made this dish many times and think it is wonderful. I leave out the green chilies for the ones for my children. Everyone in my family loves it. This shrimp recipe was delicious. All the flavors just burst in your mouth. I made this recipe for the first time last night. It was great! My only recommendation is to either precook the bacon or be sure to cook it on a grill- otherwise the bacon doesn't come out crisp. This recipe was simpy great! I made this for my mother and she absolutely loved it. I would truly recommend this recipe to anyone. This was my fist time cooking with my father-in-law. We made this recipe, along with a tossed salad (with avocadoes), mashed potatoes, and rolls. The shrimp tasted great! This was good, even for people who don't like spicy foods - I just eliminted the chili's and it was still delicious!